RE: THE ACTIVATE! NATIONAL IMBIZO IS UPON US. JOIN THE CONVERSATION ON ALL OUR DIGITAL PLATFORMS. - Activate! 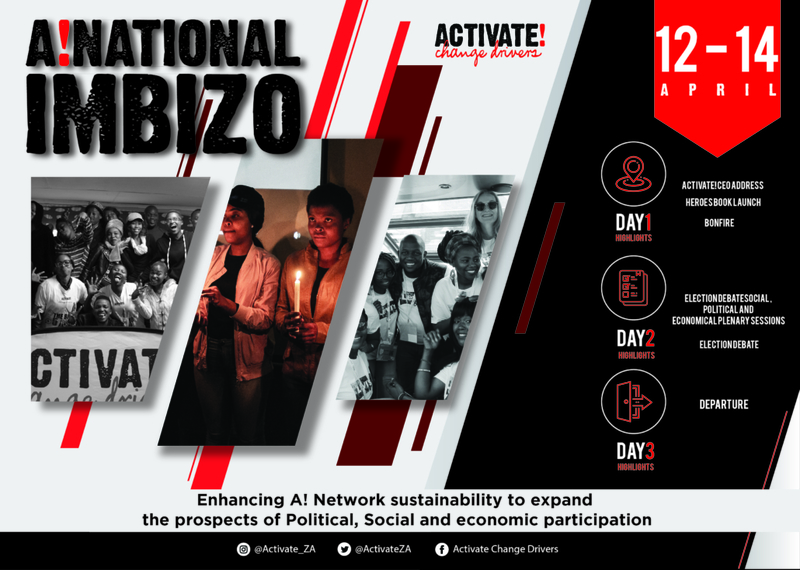 Activate National Imbizo 2019 will be held at the Alpha Conference Centre, Broedestroom, in the North West Province. This national gathering seeks to create an enabling environment for Activators to critically reflect on the pressing question of network sustainability and strengthen the Activate network to expand agency, opportunity and prospects in the political, social and economic sphere. The National Imbizo will take place from the 12-14 of April 2019. The space will take both theoretical and practical approaches within formal and non-formal education settings. Sessions will be conducted by experts and thought-leaders with extensive experience and knowledge in community development, advocacy and activism. The ACTIVATE! team hopes to use The National Imbizo to position and elevate the voice of young people on pertinent socio-economic issues affecting communities across the country. However, due to financial constraints, only a limited number of Activators can attend. For this reason, only 90 Activators have been selected to attend the event. Additionally, Activators across the country can participate in the National Imbizo by joining the social media conversations through our Whatsapp, Facebook and Twitter channels. Please join the conversation on all ACTIVATE! digital platforms and allow your voice to be heard. ACTIVATE! is a network of young leaders equipped to drive change for the public good across South Africa. Connecting youth who have the skills, sense of self and spark to address tough challenges and initiate innovative and creative solutions that can reshape our society.